Inbox. All new emails (besides spam and emails that end up in other folders in accordance with your automatic email sorting filters). Deleted. All emails that you manually deleted or that were deleted by a message filter you set up. Spam. Emails determined to be spam. Drafts. Drafts of emails and templates. Outbox. Emails that were not sent due to problems with the internet connection. Once the Internet connection is restored, the emails will be sent automatically. Archive. Folder for old emails. Note. If the Archive doesn't contain any messages, the folder will not display. To move a message to this folder, right-click the message and select Archive. The standard folders can not be edited or deleted. To add a personal folder, click Create folder. You can add several personal folders: they will display as subfolders in your Inbox. Note. You can create up to 1,017 personal folders and up to 32 layers of nesting. Personal folders in a list can be moved and reordered by dragging and dropping the folder to a new place in the folder list. If you can't drag a folder, check that the allow dragging and dropping of messages and folders option is enabled in your mailbox settings. Your personal folders are sorted in alphabetical order by default. If you drag even one folder to a new location, you will not be able to automatically restore the alphabetical ordering. You can, however, manually drag the folder back to its previous location. If you drag folders out of order, new folders will appear at the bottom of the list (rather than in alphabetical order). Check that the folders you created are in the list of all folders in your mailbox settings. If you see them there but they do not appear in your message list, it means that your list of personal folders is collapsed. Click the corresponding icon to expand the list. To move messages to another folder, select them and click To folder in the top menu or drag them to the folder's name in the list to the left. 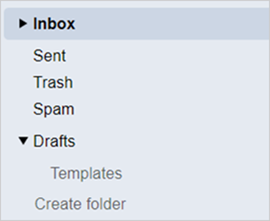 You can also move emails between folders by setting an automatic email sorting filter. 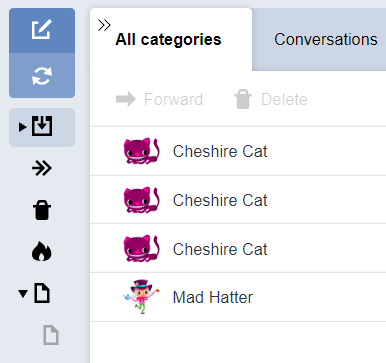 If the Archive folder does not contain any messages, it will not display in the list of folders. To move a message to this folder, right-click the message and select Archive. If you cannot move a message to another folder, refresh the page by clicking Ctrl+F5. Then clear the browser cache and delete all cookies before trying that action again.